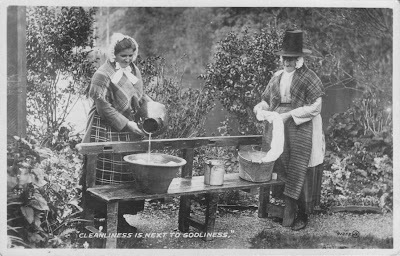 On this card with ladies in Welsh costumes doing the weekly wash outside there is the slogan "Cleanliness is next to Godliness"
"Juliet's version of cleanliness was next to godliness. Which was to say it was erratic, past all understanding and seldom seen." -T. Pratchett in Unseen Academicals.